After his appointment to the archducal court of Ferdinand and Isabella in Brussels in 1615, Ioannes Ruckers used three different rosettes to decorate the soundboards of his instruments: he used a rosette of diameter 85 mm in his double-manual harpsichords, a smaller rosette of diameter 73 mm for his single-manual harpsichord and a rosette of diameter 65 mm in the virginals that he made. 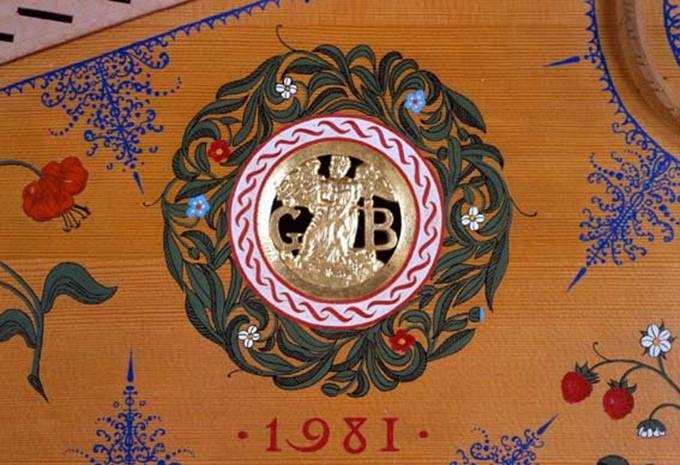 The rosette in this instrument is based on the usual 65 mm diameter virginal rosette and is, except for the initials ‘GB’, a copy of the rosette in the 1629 Ioannes Ruckers 4½ voet spinett virginal in the Brussels Museum of Musical Instruments (Brussels Museum Catalogue Number 2511). The rosette was copied, cast and gilded by Grant O’Brien.